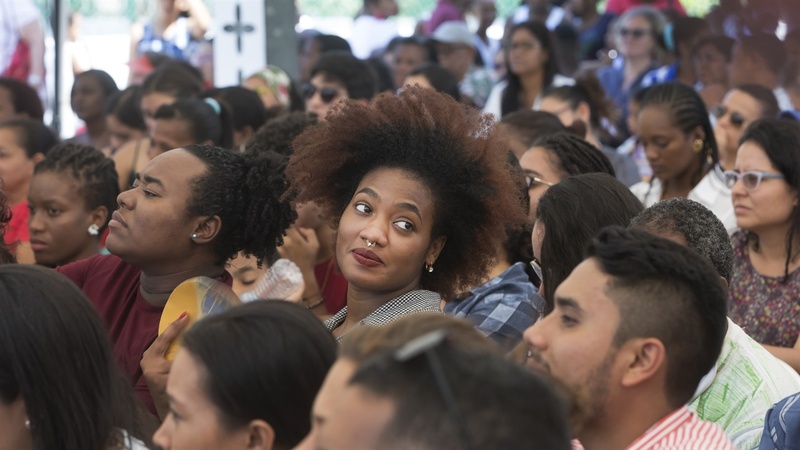 Hay Festival Cartagena de Indias 2019 offered a free program aimed at university and high school students aged over 16. In collaboration with Fundación Universitaria Los Libertadores, a series of events gathering authors and students took place at the university campus. There were 14 events covering different topics, where students had the chance to meet various participants of the Festival. They discussed journalism with BBC journalists William Márquez and Juan Carlos Pérez; Afro-Colombian poetry with Dora Isabel Berdugo, Muris Cueto, Ruth Patricia Diago and Tania Maza Chamorro; and literature with Fernando Trujillo, Dylan Moore, Juan Carlos Méndez Guédez and Julio Olaciregui. Two documentaries were screened: Eugenio García's No and Kate Horne's The Witness: Cain and Abel. Activism played an important role with Lydia Cacho and Sarah Corbett; quantum physics with José Ignacio Latorre; illustration with Aurélie Neyret and Alekos. A meditation workshop was given by Kankyo Tannier and a workshop on memes by Luna Miguel. A popular character on social media also took part in Hay Joven: Mildre Cartagena, the witty costeña mum played by Katherine Pascuales.